My journey into the literature of 1967 this month sees the appearance of another of my favourite writers, Georges Perec. In 1967 Perec’s career was only beginning; his most famous novel, Life: a User’s Manual, was over ten years away, and his first, Things: A Story of the Sixties, had appeared a mere two year before. 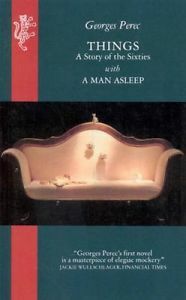 When the latter was translated into English in 1990 it was partnered with Perec’s 1967 novella, A Man Asleep (translated by Andrew Leak). As with most of Perec’s work, a plot summary is not only challenging but also inconsequential: A Man Asleep is a story where nothing happening is exactly the point. A Man Asleep reminded me of a more recent novel, Helle Helle’s This Should Be Written in the Present Tense. Helle’s novel appears superficially (i.e. to me) to be about a woman who is depressed, but Helle herself saw the novel as optimistic, simply about someone who was drifting through life, almost as if this were a necessary stage. While Perec’s novel is apparently based on his own depression when he was twenty, the ending suggests he sees something necessary about that period of his life, and the first sight of an escape. Certainly the novel captures as well as any other what it feels like to be young and paralysed by unhappiness; Perec, for all his technical tricks, understood emotion. You are currently browsing the archives for the Georges Perec category.